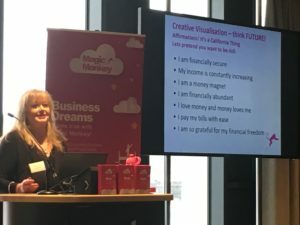 A Dream Ticket™ seminar is a one hour event that will introduce you to the concept of Business Visualisation by way of identifying critical intangible assets that your business may need to include in your Dream Ticket™. We also walk you through the 10 steps to create a Dream Ticket™. You will be introduced to the four categories of assets from which around 25 to 35 will be relevant to your Dream Ticket™. Market Assets – these are assets that give a business power in the marketplace such as company names, brands, brand recognition, customer loyalty and many more. Intellectual Property Assets – these are assets “of the mind” that are legally protectable such as patents, trademarks and copyright and more. Infrastructure Assets – these are the systems and procedures that give a company its operating strength. These are typically systems, standards and many more. Human Centred Assets – these are the assets provided by the skills and knowledge of employees and contractors such as market knowledge, work competencies, creativity and more. You will see how the set of assets chosen for a particular Dream Ticket™ can be strengthened over time using measures to create the environment where business goals can be achieved. You will walk through a case study spanning a six year period watching a live Dream Ticket™ as it changes over time and see first-hand how to create a healthy business environment for your company to grow. Fill out the form for a free 20-minute Q&A session on Tactical Marketing with Annie. − Dr Janette Thomas, AccentBio Ltd.
As a denizen of Silicon Valley for over 25 years, Annie proved to be the best strategic marketing person I have ever witnessed. Her laser focus on the imperatives of purpose, unique contribution, channels and message development enabled rapid profitability for our clients repeatedly. Annie Brooking is simply the best strategic marketer I've met in the UK, her ability to focus a product-to-market strategy ensuring that the user gets a compelling experience while making the best use of a technology platform is unerring. Annie is one smart lady with a formidable skill set. It is always difficult for small high-technology companies to make the transition from being a startup to a commercially focused business. This is where Annie comes in and makes all the difference. I work with CEOs, executive teams of SMEs, investors and product development teams including engineers, marketing folks, customer sales and support teams and manufacturers. No matter what your position is, I have the knowledge you need to take your company to the next level. Call for a free 20-minute Q&A session on Tactical Marketing with me.